This weekend is a very soap intensive weekend for a few reasons. 1. Testing out the S.O.A.P Panel FOs, 2. 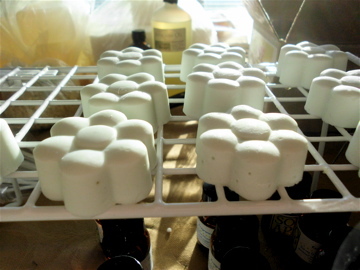 Making my CP soap for the soap swap, and 3. Getting ready for my craft show on the 19th. But, I do love a challenge so let’s talk about number 1. I want to test out each FO in a variety of applications. The first application is Melt and Pour. I used 1.5 oz of white MP with 1 ml of each FO. Here are the initial results right after the pour. Discolored to cream. Stronger scent then #1. Nice sweet Gardenia scent. Single note detected. Discolored to cream. Richer Gardenia scent. Most realistic to me. Can get more notes from this FO. White. Lilac scent comes through. Nice balanced floral. Discolored to light cream. Complex scent with strong butterscotch note. Possible floral top note. White. Very light clean smell. Hard to pick out any individual notes. White. Strong floral almost citronella smell. Hard to pick out any other notes over the citronella. White. Nice earthly floral. Very well-rounded with possible lily note. White. Strong sweet cherry blossom note. White. Strong lilac Scent with a possible slight citrus undertone. 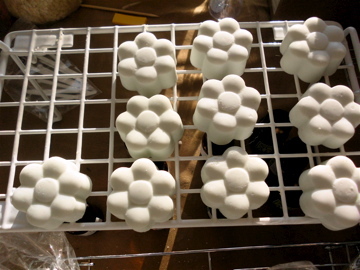 I think the next test will be bath bombs since I am already in that mode for the craft show. It would be interesting to see what notes come out when they are dropped in water.